Chinese President Xi Jinping has made many foreign trips around the world. To save time, he tends to visit several countries within one trip, except for the neighboring countries like Russia and South Korea. Therefore, the U.K. is the only non-neighboring country for one flight. 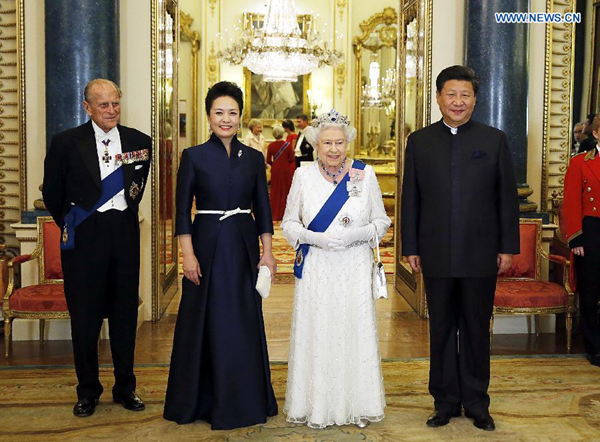 Does it indicate that the U.K. is important in China's foreign diplomacy？The answer would be "Yes." The UK's willingness and boldness in joining the Asian Infrastructures Investment Bank initiated by China, as the first major developed country, upset the United States and sent out a clear signal that it wishes to further develop relations with the largest emerging economy. As two of the most important countries in the world, China and the U.K. can deepen their cooperation in global governance. At a recent meeting attended by the top leadership in Beijing, President Xi expressed China's views on global governance and promised that China would join hands with other countries in promoting global governance. Although some say the U.K.'s international position and global influence is in decline, it is undoubtedly still a major power on the world stage. It is a permanent member of the U.N. Security Council, a member of the G20 and many other important international organizations. It has nuclear weapons, and, according to the World Bank, its GDP ranks fifth in the world. Therefore, there will be many opportunities of cooperation between China and the U.K. on issues such as climate change, cyber-security, anti-terrorism, energy and food security, international finance and trade reforms. In contemporary world affairs, trade and investment are the foundations for any bilateral relationship. In the EU, the U.K. is the second largest trade partner, the largest destination of Chinese investment and the second largest source of foreign investment in China. In 2014, bilateral trade reached more than US$8 million. Moreover, the U.K. also hosts the largest trading center for China's RMB. In 2013, China put forward a grand initiative, the Silk Road Economic Belt together with the 21st Century Maritime Silk Road. China and the U.K. might think of effective ways of cooperation in implementing the initiative. The U.K. can participate in it by making joint ventures with China in building infrastructure for the countries along the Belt and Road. The realization of a "RMB internationalization" has been one of the most urgent objectives for China's external economic strategy. The U.K. has comparative advantages in international finance. Therefore, a win-win outcome would exist for both countries to cooperate in this area. The U.K. is China's second largest trade partner in the EU and the largest destination of Chinese investment. How can these two nations continue toward a shared future?